With the support of our workforce, we have been able to provide optimum quality products. Our professionals possess years of knowledge and experience in the domain and work hard to manufacture products as per the specifications laid down by the clients. Our team comprises of skilled professionals, quality controllers, engineers, market researchers, management staff and sales. We have appointed experienced, talented, hardworking and knowledgeable team of professionals for each department that work close coordination in order to gain complete organization goal. 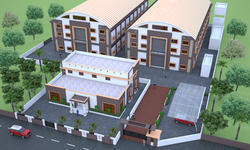 By providing products at budget friendly rates, we have reached a commendable position in this industry. Located in India’s salient industrial zone – Rajkot, Gujarat, Tilara Polyplast Pvt. 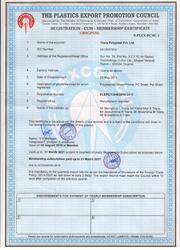 Ltd. is an ISO 9001:2015 (Quality Management System) certified manufacturing company adhering to quality confirmation. MFI Test, Impact Test, Transmission test and Haze Test are part of our ongoing tests and daily routine to trace and improve vitality of TILARA POLYPLAST products. 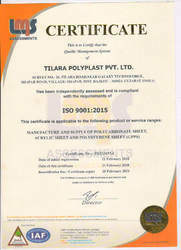 Tilara Polyplast is also equipped with quality tech lab, technically sound team and in-house facility of Thermoforming. TPPL (Tilara Polyplast Pvt. Ltd.) with its wisdom have incorporated best extrusion technology to help elevate the overall shine and strength of our entire product. 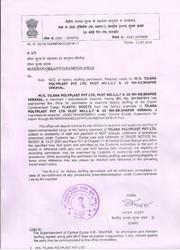 We as Tilara Polyplast Pvt. Ltd. has a purpose, and to bring in Technology leading finest quality to our partners and help ease your business to Elevate. Extrusion Technology comparable with the “Best in the industry” . TPPL have invested & incorporated in Massive capabilities bringing in Massive Results. On Behalf of entire Tilara Parivar, we welcome you to our Journey & we wish you success in future endeavour.